The Close Gaps dialog box lets you close up drawing areas that not are closed. This may sometimes happen when painting. You can close small gaps in a drawing by creating small, invisible strokes between the two closest points to close the colour zone. You do not need to trace directly over the gap. You can draw it a few millimeters away. The two closest points automatically close the gap. For tasks related to this dialog box, see Closing Gaps. To flatten the strokes you draw, click the Auto-Flatten button in the Tool Properties view. Select Drawing > Clean Up > Close Gaps or press Shift + F10 (Windows/Linux only). Lets you set the size of the gap you want to be closed. 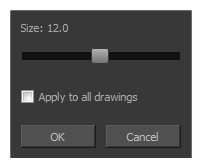 Closes all gaps in the drawing of the selected layer.